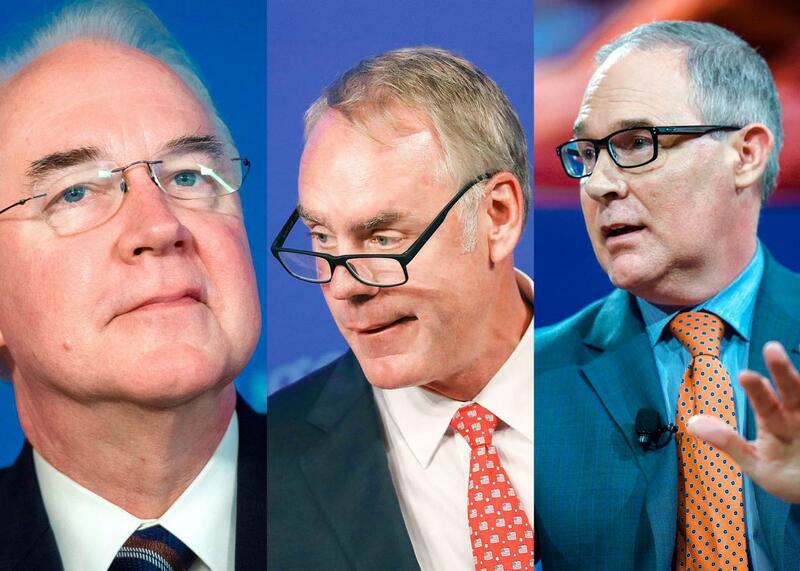 The charter flights of Price, Mnuchin, Pruitt are the tip of the corruption iceberg. The pervasive abuse of taxpayer money—and trust—will make our democracy harder to repair. Tom Price, Ryan Zinke, and Scott Pruitt. Photo illustration by Slate. Photos by Getty Images. Want to listen to this article out loud? Hear it on Slate Voice. Amid the chaos and dysfunction that marks Washington in the age of Trump, it can be easy to miss that this White House is corrupt. Remarkably, unbelievably, corrupt. Compared with other crises and controversies enveloping this administration, mere graft seems minor. It’s not a natural disaster, an FBI investigation, or an open display of sympathy for white supremacists. Still, the corruption shouldn’t be dismissed. Not just because it’s wrong, but because it puts serious stress on our democratic institutions at exactly the time they need support. At the center is President Trump himself, who treats the treasury like a slush fund. Trump takes regular trips to his properties in Florida, New Jersey, and Virginia. At last look, according to the New York Times, he spent 85 days visiting at least one of his properties out of a total of 249 days on the job as president. These trips aren’t cheap. Definitive numbers are hard to come by, but in August, the left-leaning Center for American Progress Action Fund estimated that Trump had spent more than $31 million on trips to his hotels, golf courses, and resorts, which includes expenses for his staff and security. What makes this graft and not just waste is the fact that it goes directly from taxpayers into the president’s own pockets—Trump refuses to divest from his businesses, meaning he has a financial stake in their use by the government. These expenditures don’t even account for the fact that, because he occupies the Oval Office, Trump has been able to charge more at his clubs and hotels, cash that flows to his bank accounts. Then there are the members of the president’s Cabinet, who face growing scrutiny for their abuse of taxpayer funds. Tom Price resigned his post as secretary of health and human services after a Politico investigation revealed that he had spent nearly $1 million on charter and military flights for both routine and personal travel, spending tens of thousands of dollars on just one trip to Philadelphia and charging the government for a $17,000 trip to Tennessee to give a brief speech and have lunch with his son. Treasury Secretary Steve Mnuchin is also under fire for his method of air travel. Mnuchin didn’t just use a military plane to travel with his wife to Kentucky on what appeared to be a personal trip to view the solar eclipse; he’d also requested use of a government plane for his European honeymoon. It keeps going. Scott Pruitt, head of the Environmental Protection Agency, spent more than $900,000 on private flights, ’round-the-clock security, and a soundproof booth in his office. Not only that, but as the New York Times notes, he has “held back-to-back meetings, briefing sessions and speaking engagements almost daily with top corporate executives and lobbyists from all the major economic sectors that he regulates.” That unusual amount of time with industry groups includes “frequent, government-funded trips” back to Oklahoma, where he served as attorney general (and frequent antagonist of the EPA), and expensive meals with industry leaders, among them major donors to President Trump. Two other members of Trump’s Cabinet, his Interior Secretary, Ryan Zinke, and his head of Veteran Affairs, David Shulkin, are also under scrutiny for their travel choices. Zinke chartered a $12,000 flight from Las Vegas to Montana while Shulkin spent thousands on a European trip that included sightseeing with his wife and seats at a Wimbledon tennis match. These are varying degrees of offense. President Trump’s actions are arguably in violation of the Emoluments Clause of the Constitution, an impeachable offense. Price’s high-rolling travel habits were an obvious abuse of the public trust, and Pruitt’s close relationship with the fossil fuel industry—and his support for their priorities, like rescinding the Obama administration’s clean air regulations—is reminiscent of the worst of Gilded Age entanglement between business and government. Zinke’s and Shulkin’s activities, on the other hand, are merely unseemly. That these aren’t uniformly egregious, however, doesn’t mean they aren’t significant. In any other administration, this graft and abuse of public resources would be a defining scandal, an event that—like the Teapot Dome—would find its way into public memory. And while it’s tempting to say these are ultimately minor concerns—pocketing taxpayer dollars is nothing compared with provoking a confrontation with a nuclear-capable, isolated dictatorship—the truth is that they matter as much as Trump’s worst offenses. Democracy needs trust to survive, and corruption erodes that trust. The longer it continues, the more it becomes just the background noise of our politics, the harder it is to plot a correction and restore the democratic faith necessary to tackle collective problems. If, like many in the Republican Party, one does not believe in collective action for public good, then this is not a problem. For those of us who do, however, it is a crisis.